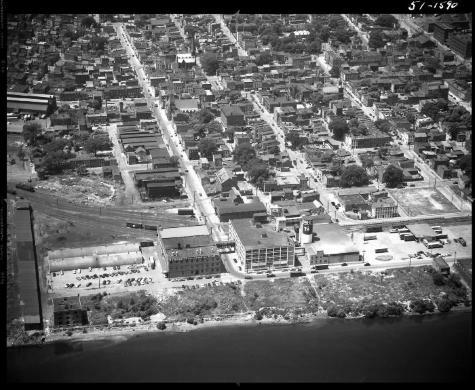 Aerial view the B. T. Babbitt Company on Broadway along the Hudson River in the city of Albany, Albany County. The building was constructed to serve as one of their soap manufacturing facilities. The slogan "Home of Bab-o" can be seen painted on the front of the building. The surrounding community including several blocks of homes, public buildings, industries, roads, and a Delaware and Hudson Railroad line are also in view.